It's as if Sony doesn't realize how cutthroat this market is. Snapdragon 820 performance, waterproofing and microSD support aside, there's not enough here to recommend this overly expensive Android phone. Update: Barring a few differences, the Sony Xperia X Performance brings most of the same goods as the Sony Xperia XZ, but for a cheaper price. Not only has this device become cheaper to purchase since it launched, it has also received a welcome upgrade to Android Nougat. This means that it's secure and stocked with enhanced battery-saving features and multitasking is even easier thanks to the multi-window mode. Looking forward, we've heard that Android O will be heading to this device. So even though you won't have the latest specs, you'll have the latest software. The Sony Xperia X Performance is a phone that makes a statement. It's just not a very consistent one. Like the others in the new X series, the Sony Xperia X Performance is really good at waving all the signs of a flagship phone. The eye-grabbing glass and brushed metal design make it enjoyable to look at and its 5.6-inch body fits nicely in one hand. Underneath the hood, though, there's a mix of what you'd expect to find in a top-tier smartphone, but with a few unpleasant surprises tossed in. It contains the high-end Snapdragon 820 processor, but backs it with only 3GB of memory. The waterproof phone comes with the latest build of Android Nougat, offers PS4 Remote Play, and expandable storage. But the screen is limited to 1080p, and the battery capacity is a rather meager 2,700mAh. These shortcomings would be excusable if the Xperia X Performance were the least bit competitive in price with some of recent unlocked movers-and-shakers, like the OnePlus 3 or ZTE Axon 7. But it's not even close. 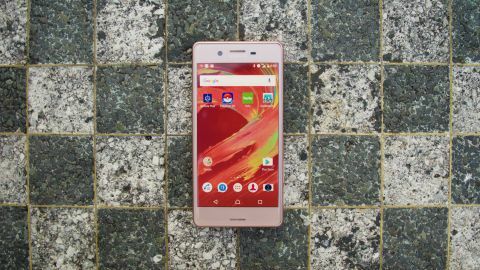 At US$699 (about £541, AU$913), this phone just about doubles the price of some more capable options, even costing slightly more than the Samsung Galaxy S7. It's puzzling. For a phone positioned near the top of Sony's offering, the Xperia X Performance is either woefully under-specced, or just too expensive for what you're getting. How about both? If you're hoping for a flagship smartphone that balances power, design and value in equal measure, you'll be better served by another phone on our best phones list. If you're seen one Xperia device within the past few years, you've seen them all. The Xperia X Performance falls neatly into that group, but it's not a bad thing at all. Minimalists will love the Xperia X Performance for its subtle design touches. In the rose gold review unit provided to TechRadar by Sony, the brushed metal back and edges nicely play off the ever-so-slightly curved front panel. The port layout is thoughtfully placed around the phone, and at first glance, it seems that so too are the buttons. While the power and dedicated camera capture buttons are easy to use and access during everyday use, the volume rocker is a bit of a nightmare. Located on the bottom right side of the trim, it makes a simple task needlessly difficult. The odd reach even caused the phone to slip out of our hands on occasion. If you're looking to get this phone in the US, here's one more knock against the X Performance: it doesn't have a fingerprint sensor built-in like its UK counterpart. For whatever reason, it has been omitted, though Sony's website states otherwise.